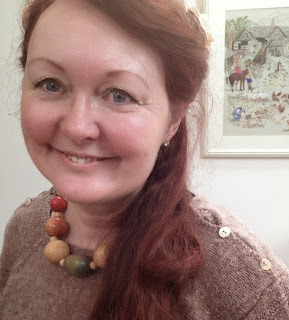 My daughter Charlie, is very familiar to many knitters both in the UK and around the world. She has been modelling for me since I first started in this business and she was a wee, slip of a thing. She has been amazed over the years when people have spoken to her or even contacted her via social media to ask her if she is the model they have seen wearing such-an-such a pattern. She has never declined to be a model and has also been my photographic assistant on more shoots than I can remember, often producing just the right shot that we need. In fact, Charlie had always been interested in photography, going to a local junior photographers club from around the age of 8. Coupled with an inherited obsession with film, it was really no surprise when she chose to move to Edinburgh to study Film at Edinburgh College of Art. The four years are passing in a blur and she is now working on her graduation film which will hopefully provide her with the results she is aiming for to move onto the Masters programme at the same college. Her chosen area is documentary and she has already produced some beautiful short films about people around her. Charlie has also modelled for my very good friend Woolly Wormhead and stayed with Woolly and her family along with me when I have visited but also by herself, becoming good friends with Woolly independently of me and also forming a wonderfully close bond with Woolly's son, Aran. Charlie's plan for some time has been to feature the Mutoid camp where Woolly and Aran live in her graduation film, and gradually after discussions with myself, her tutors and particularly Woolly, the project began to take shape. Charlie's film will look at life in the Mutoid camp through the eyes and imagination of 6 year old Aran. It promises to be a beautiful film, but to be able to make it, Charlie will need to travel to Italy two or three times in relatively quick succession over the next couple of months to get all the footage she needs and therefore needs funding to help her fund travel and production costs. So yesterday, she launched her first ever Kickstarter appeal to raise £800 (£850 including kickstarter fees). You can find out a lot more about the film and Charlie's approach on her Kickstarter page. If you are able to pledge even the smallest amount, or spread the word about her appeal that would be simply wonderful! When Charlie launched the appeal yesterday, she genuinely didn't believe anyone would find her project interesting enough to pledge, but people have already been incredibly generous and I really can't thank you all enough. Charlie really has to fight a lack of self confidence but I, both as her mother and as a former art teacher, can see her developing almost daily, turning into the Director and Artist that she could and should be. I am so very, very proud of my little girl. Posture is the way we sit, or stand, or walk, you know. Good posture or bad posture can change the way I grow! Good posture is important, so I use it every day! A very good friend of mine is the latest in a long list of crafters I know to have been hit with RSI related problems brought on by a combination of computing and knitting. Its one of those things that tends to plague knitters and in particular knitwear designers as when we're not knitting, we are on the computer typing up patterns and running numbers through spreadsheets. And much of the time these activities are undertaken in less than ideal situations and a lot of the time, poor posture and incorrect seating is contributory to the problems we experience. 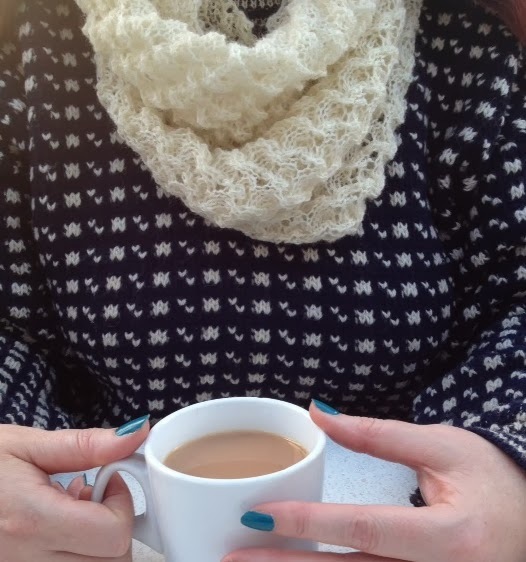 We all hear and talk about RSI but exactly what as knitters are we vunerable to? What is RSI? It is classified as a neurovascular syndrome and is identified as chronic or prolonged pain in the hands, shoulders, back or neck, caused by the constant repetition of a series of movements. Its onset can be insidious, its diagnosis problematic and its results irreversible. It affects the soft tissues, nerves, tendons, muscle and cartilage. If left untreated, it can lead to permanent disability. The truth is, that as knitters, we spend hours repeating a small number of motions, so therefore are at risk of RSI; as is anyone who sews, crochets, plays a musical instrument or works on a computer. RSI develops over time and its symptoms often come on gradually. Once you become aware of the symptoms there is another catch. Diagnosing RSI is difficult. Therefore we needs defensive tactics whether already a sufferer or just a concerned knitter. You can do many things to keep your symptoms in check or to prevent RSI. TAKE FREQUENT BREAKS. PUT DOWN YOUR NEEDLES AND FLEX YOUR HANDS, FINGERS, WRISTS, SHOULDERS. WARM UP! STRETCH YOUR HANDS BEFORE YOU KNIT. Knitters can be at risk the moment they sit down. Many of us slouch, shoulders drooping and head bowed. Manipulating the needles forces the hands and elbows into an unnatural fixed position for long periods of time. The wrists are flexed up, stretching the tendons. The fingers and thumb exert pressure to hold needles and yarn. Passing the yarn over the needle involves repeated finger movements and the weight of the work in progress also drags on the wrists. Over time the rhythmic sequence of knitting and purling can pinch nerves and other soft tissues. Sitting properly can spare your aching hands. The back supports your entire body, and proper spinal alignment is needed. Sit up straight without hunching your shoulders and neck. Your feet should be squarely planted with legs bent at a right angle – NOT CROSSED. Keep your elbows close to the body, bent at a comfortable angle, not sticking out from the body. Hold needles in your hands, and if possible not tucked under your arms as this can cause additional shoulder problems. There is no correct or wrong way to grip the needles but try not to bend the wrist back too much. Circular needles are better than straights as they spread the weight of the knitting and wooden are better than metal or plastic as they flex with the hand rather than resist. If you are having problems thicker needles are better than thin as you are not gripping as tightly. With crochet hooks you can make a handle out of sponge rollers to prevent you having to grip the hook so tightly. In addition tight knitters put extra strain on their hands, so try and loosen up and relax your tension slightly – use a bigger needle. CTS is probably the best known RSI. More than 8 million Americans alone have this condition in which the hands’ median nerve is trapped inside the carpal (wrist) tunnel. This cavity is formed by the transverse carpal ligament, an elastic tissue that surrounds the eight bones in the wrist. When repetitive movements irritate the slippery protective lining of the flexor tendons, they become swollen inside the carpal tunnel, compressing the median nerve. This leads to pain, tingling, loss of strength and reduced range of motion. Also know as Ulnar Neuropathy. Caused by leaning on elbows, holding the telephone, knitting, typing – anything that requires repeated bending and straightening of the elbow. This can lead to inflammation of the ulnar nerve, which travels from the neck to the elbow then to the fingers. Symptoms are similar to CTS except the pain is felt in the ring and little fingers. Also known as Epicondylitis, results in small ruptures in muscles and tendons located in the inside of the elbow. The muscles and tendons that bend the wrist start in this region. Wrist and hand movements create small tears and scarring in the muscle and tendon fibres. Symtoms are the same as tennis elbow but felt on the inside of the elbow. Tennis elbow is felt on the outside of the elbow, travelling down the forearm to the middle and ring fingers. Bending the wrist back or turning the palm upwards makes it more painful. This is a condition where an irritated tendon cannot slide easily through a cavity. A knot forms blocking the space leaving the finger bent. I try and do at least some of the following warm up exercises every morning. Perform the stretches in a basin large enough for you to immerse your hand, forearm and if possible, elbow. The water should be as hot as you can stand. Finger stretch: Stretch out your fingers as wide as you can and hold for a slow count of 10 to 20 seconds. Bend your fingers and hold for a count of 5. Repeat up to 10 times. Wrist stretch 1: Pull your hand backwards gently with your fingers and hold for a slow count of 10. Repeat with the other hand. Wrist stretch 2: Make a fist. With your other hand, push down on the fist and flex it forwards towards the wrist. Hold for a slow count of 10. Repeat with the other hand. Place your hands together in the prayer position. Raise your elbows out to the side, keeping the palms together. Spread your fingers wide and bring them together again, slowly, five times. Repeat. Good for in a car with a head rest, or lying down with a cushion under your head. Tuck your chin down toward your chest and push your head against the headrest or cushion. Hold for a count of twenty then relax. Repeat 3 times. Stand or sit up straight. Shrug your shoulders as high and tight as you can and hold for 10. Relax. Repeat 3 times. Then shrug your shoulders back as far as you can and hold for 10. Relax. Repeat 3 times. These are the things we probably all do much of the time! Don’t keep wrists bent towards you for long periods (flexion) as irritates the nerves and tendons in the wrist. Don’t tilt your hand in the direction of the little finger (Ulnar deviation) - this position folds the tendons over the wrist bone putting needle strain on the tendons. Don’t grip or grasp an object for long periods of time. This contracts forearm muscles, pull tendons and creates pressure and rubbing in the carpal tunnel. Don’t pinch (grasping with only the fingers) – causes additional pressure in the carpal tunnel. Don’t keep elbows bent forward (as in at a keyboard) for long periods – causes compression of the nerves causing irritation. Don’t lean over your work. Strains neck and shoulders. Also can impinge on nerve roots. Don’t keep your arms in a work position for a long period of time, the constant stress of supporting the weight of your arms and your work can irritate the shoulder. I also go for regular sports massage to relax the muscles and to remove the built up toxins found in them and this helps a great deal. But if you haven't got time for exercising or massages, just change your position regularly, let go of the needles or stop typing, stand up, walk around, move your shoulders, but remember to treat your body gently and with respect. A few months ago I took my first direct foray into the commercial manufacture of yarn, purchasing spun undyed wool on the cone from John Arbon and then working with a commercial dyer based in the Scottish Borders to create new Excelana colours to complement the existing colour palette and offer an instantly broader choice. I have learnt a heck of a lot on this journey - its a steep learning curve believe me - but the most significant of these is the time it takes from idea to fruition. However earlier this week the wait was finally over, and along with another huge order which I'll share next time, I received three beautiful new colours of Excelana 4ply which all look exactly like I had planned! The yarns are currently still on cones so there is one final step in their production before they are ready for sale which is of course the balling and banding. We don't have our own balling machine - as yet! - so we have to take the yarn on a trip to nearby West Yorkshire to be wound off into 50 gram balls ready for selling. The yarn should be ready before the Unravel show in Farnham in late February, however there is a limited amount of the yarn so I hope to make it available for pre-order on the online shop early next week so that you can be sure of getting some. If you like them as much as you like Dark Mandarin they're not going to last very long that's for sure! 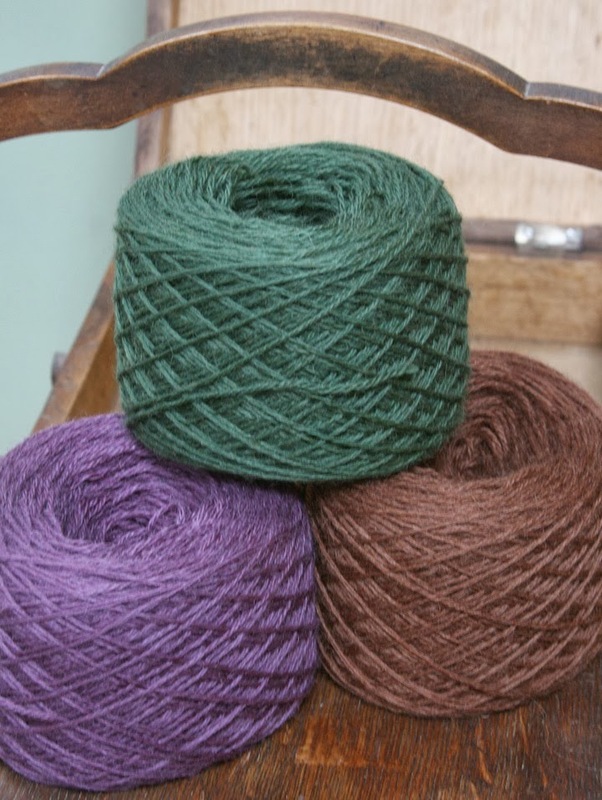 All three colours are only available in Excelana 4 ply for the forseeable future. They are the same composition as the existing Excelana, being 100% pure British wool, 70% Exmoor Blueface, 30% Bluefaced Leicester and each 50 gram ball has a meterage of 159 metres. These three colours will be available exclusively from my online shop due to the limited stock levels. 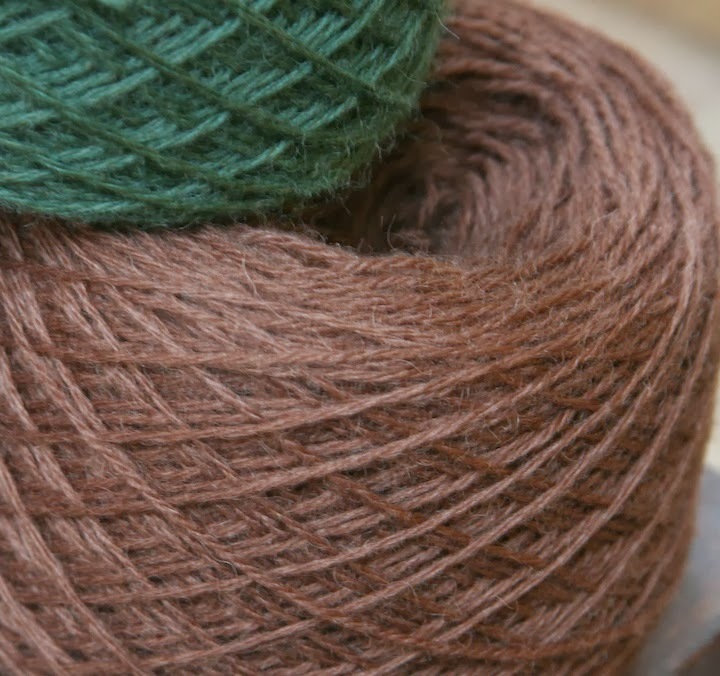 On my ravelry forum this warm brown shade has been repeatedly asked for and I have been desperate for a rich brown in the range for a long time. It works perfectly with the other new colours in the range as well as the existing palette. 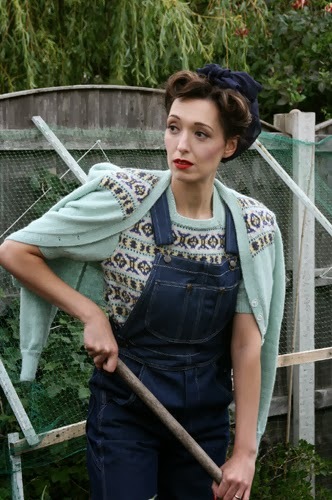 I desperately 'need' the Lady's Jumper Cardigan from A Stitch in Time volume 2 in Sweet Chestnut. This one took a lot of getting right. It is based on a shade I found on a 1930s shade card and manages to be vibrant yet soft at the same time, blending beautifully with the other colours. The Fair Isle twinset from A Stitch in Time combining the three new colours along with Dark Mandarin, Saharan Sand and Alabaster will create a wonderful autumnal outfit. 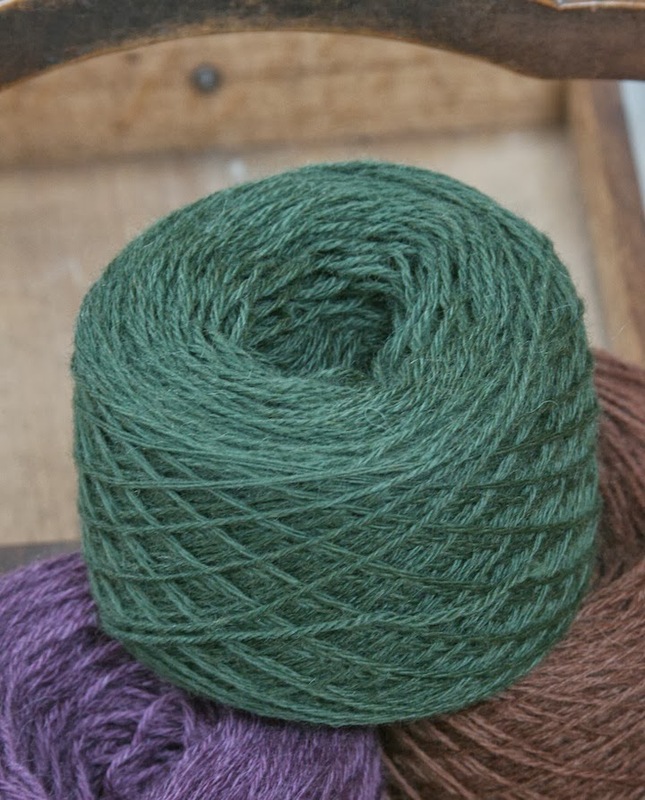 I toyed with calling this so many other names but at the end of the day, it was the Land Army jumpers that inspired me to create this colour, so really their was no other name that would do. I plan to knit the Warm Jumper also from A Stitch in Time volume 2 in this colour at the earliest opportunity, as it will make a fabulous 'workwear' style jumper with my dungarees! So which is your favourite? And what would you knit with them? I had a lot of fun over the Christmas holidays wearing knitwear every day - something which I've come to realise I do most of the time anyway without even thinking about it - and recording it on Instagram. So I thought to get the blog up and running for 2014 I would share with you some of the knits I wore. 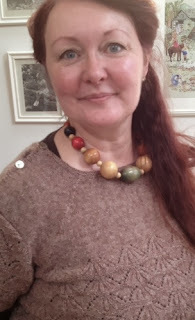 The photos are on the low quality side I'm afraid as I managed to forget to save the originals in my enthusiasm but nontheless I think they really show how your vintage handknits can be integral to your every day wardrobe. Some of the knits I made myself and others are vintage finds or even new knits purchased! This first cardigan I bought about three years ago from Andersons of Lerwick. It is knitted in pure Shetland wool and is the quintessential round neck, yoked cardigan which has become synonomous with shetland knits of the 1960s. The cardigan is hand framed and then hand finished by the ladies who work at Andersons. Its one of my most favourite cardigans in the world and I must wear it at least once every week during the winter. Interestingly this garment is seamed as you can see on the yoke. This second cardigan is my other go-to cardigan. This is the Bubble Stitch Yoke cardigan from A Stitch in Time volume 2. It has a very 1950s feel to it yet was created in the 1940s when the fashions of the period where on the cusp of change. War was over and materials were becoming more easily available hence the longer length sleeves and hip length of the body. Also note the high neck and ample buttons. My version is knitted in Excelana 4 ply in Saharan Sand. 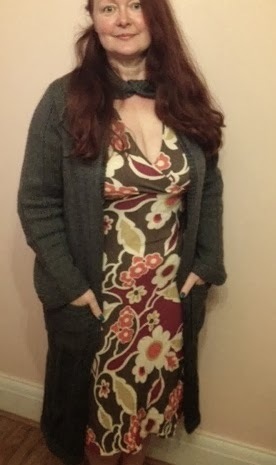 I can't tell you how many times I've worn this cardigan but it is a lot! What is particularly lovely about it is that mum knitted the lower parts of the body that didn't have any shaping or buttonholes and then my mother in law and I took over and finished it. This jumper was my find of the year in 2012. A hand knit vintage Icelandic lopi knitted in a typically chunky but light lopi yarn in natural colours with this beautiful stylised leaf pattern on the yoke. It is knitted in one piece and is completely seamless. This jumper has a longer line finishing mid thigh. It is quite fitted which I prefer to oversized as 1) it still fits under a jacket and 2) it doesn't make me feel like Michelin woman. A simplified version of the yoke pattern is repeated just above the welt and cuffs. It is a very warm jumper so I tend to save it for outdoors but worn inside it does mean I can leave the heating off! Another favourite from a Stitch in Time volume 2 now. This is Lady Georgiana's Jumper. It is knitted in Excelana DK and I've used French Rose here. The v neck and lace panels on both sleeves, front and back stop the jumper from being overly hot indoors and is a really easy knit to wear. Double knit weight yarn and all over single rib did have me worried that I could look a little 'bulky' in this jumper but actually it is a really flattering jumper. I was lucky enough this year to have a very lazy Christmas Day. Our daughter, Charlie very kindly made Christmas dinner and I was repeatedly told to go and sit down and chill. 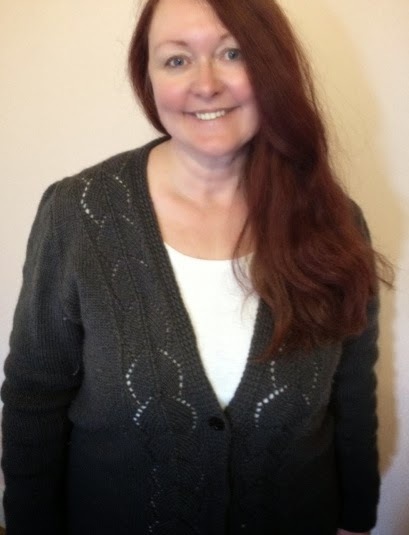 As you can see from this photo I didn't even do my hair but felt extremely relaxed in my Agutter cardigan, again knitted in Excelana DK but this time using Persian Grey. This cardigan is probably the most casual garment I have designed although equally it can look really smart with a 1980s collared dress underneath. For this occasion I wore it with a silky long sleeved jersey top underneath and my 1930s style wide legged palazzo pants - or my eating pants as I fondly call them. As they are very generously shaped they allow for huge numbers of roast potatoes to be eaten in any one sitting! The cardigan is knitted in separate flat pieces and seamed. For this longer line of slightly oversized garment I feel the side seams in particular help it keep its shape and stop it from dropping. These two photos show me wearing the original Ena Sweater from A Stitch in Time volume 1. It is knitted in Jamieson & Smith 2 ply jumper weight Shetland wool and even 5 years of being used as a display garment or being worn, it looks like new. 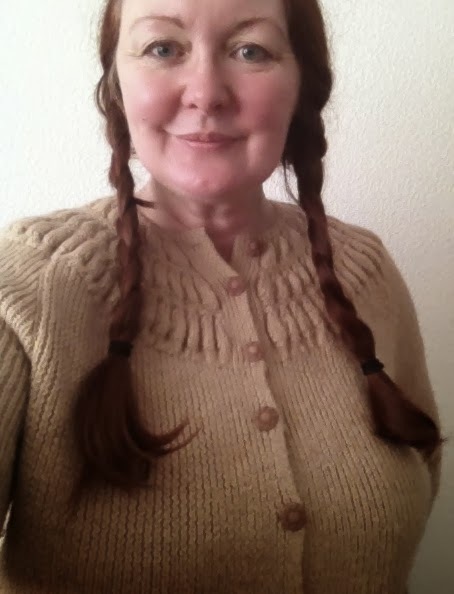 It was the very first garment I knitted for the Stitch in Time books so has a very special place in my heart. Again it has that marvellous balance of smart yet casual and effortless comfort that you want from knitwear. I also like and need my knits to have longevity and this garment is the perfect example of this. 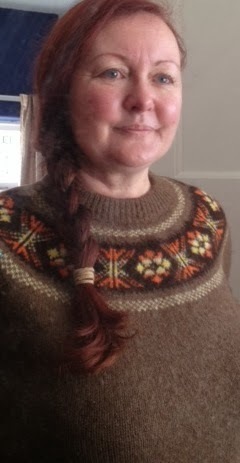 The vintage beads also appeared with this jumper in the photoshoot for this garment. These two photos show both a vintage and a new piece combined. 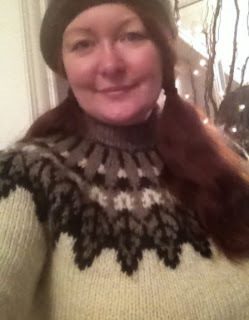 I bought this genuine Norwegian lice jumper about a year ago at a vintage sale for about £10 - an absolute bargain. It has slightly dropped shoulders but just about right for a garment of its bulk so that I can wear one or two lighter weight layers underneath. It is again pure wool and did need a little bit of a condition when I first bought it. I'll tell you more about how I rejuvinate my vintage knits in a week or two. Initially I did buy this for Gavin but its my jumper now! And worn with my vintage jumper is a design I've been toying with for some time. Inspired by 1940s patterns, themselves inspired by Spanish Mantillas, this cowl is so light you barely notice you are wearing it. 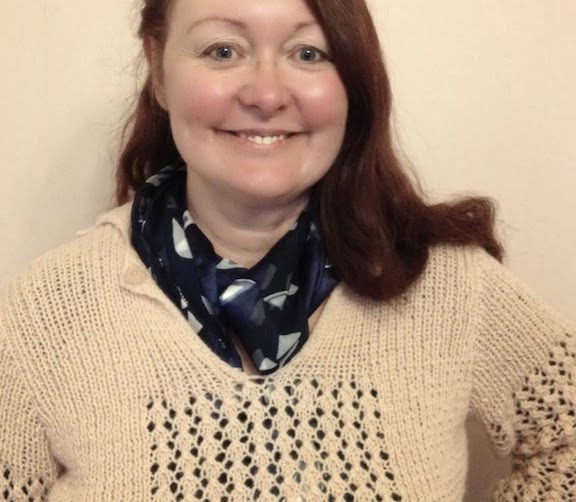 It is knitted in Fenella, my new 2 ply knits as 3 ply, 100% pure new British wool using a wonderfully 'frothy' lace stitch which I've used once before several years ago to make a curtain and I've always wanted to use it again for a scarf or cowl. Both Fenella and the kit for the cowl will be available in just a couple of weeks time but I'll tell you more about that very soon. 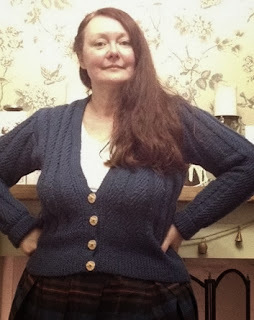 Another old favourite is this cardigan from A Stitch in Time volume 1 - The Diagonal Rib Cardigan - my version is knitted in Excelana DK using Cornflower Blue. The original pattern has 7 or 8 buttons with buttonholes up to just below the collar bone. However I have found that my body shape doesn't suit the buttons stopping at this point. It seems to maximise my chest - and frankly it doesn't need much help in that area - so I only have the 4 buttonholes that you can see on my version. When these 4 buttons are all done up they help create a bit of an hour glass silhouette. I think button placement - particularly for those of us with more for the buttons to contain - is a vital part of customising a hand made garment to fit and suit you perfectly and this is another topic I'll be talking about on the blog this year. Not the most flattering photos of me unfortunately, but here I am about to go out on New Year's eve in my Swagger Coat from A Stitch in Time volume 2. Gavin and I had been playing a wee drinking game involving Baileys Irish Cream and Game of Thrones before walking round to my in laws - I think you can probably see we were enjoying the game in my rosy cheeks. 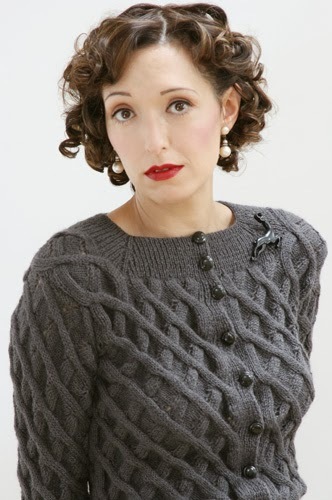 My Swagger Coat - or Miss Marple's coat as worn by Geraldine McKeown - is knitted in Fyberspates Scrumptious Aran weight. The coat has held its shape really well even though I have grown a little in the two years since I knitted it. 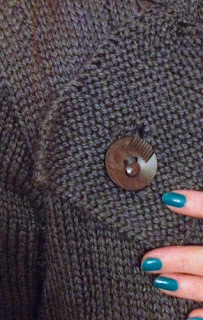 Here's a little detail of the vintage 1930s buttons I used for the fabulous cross over neck fastening. The pattern explains the correct way for fastening these and I'm sad to say that Miss Marple didn't read the pattern and is usually seen with her Swagger Coat buttoned up incorrectly. Yet another vintage yoked jumper. I absolutely love them and have quite a few now. This one is an early 60s model, interestingly knitted completely in the round this time. It has the hallmark high neck of the period and you might be surprised to hear that is extremely comfy to wear. The ribbing at the neck is turned over creating a nice stretchy top edge to the neckband and no raw edges to irritate either. I have seen tighter, closer necks than this one though so be careful and check it will go over your head before you buy. If you can't resist buying even though the neck is tight or if you've bought off somewhere like ebay, I'll be sharing a tutorial on the blog showing how to lower the neckline and create a new neckband. The colours of the yoke are quite acidic and ordinarily aren't the tones I would normally go for but combined with the very dark brown background colour and the natural Moorit shade of the main body, the overall effect is spot on. And finally, a post New Year photo for you of Gavin and me in our comfiest of comfy knits. 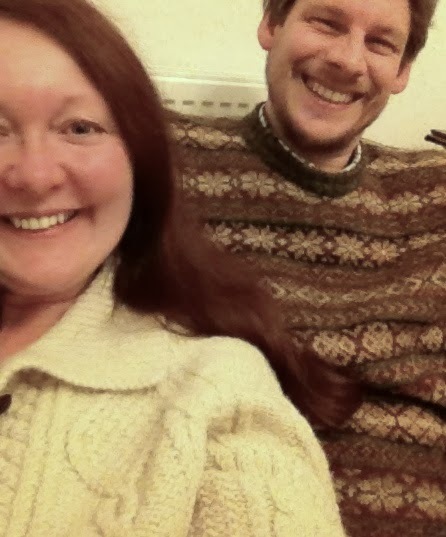 Gavin is wearing his genuine Shetland jumper purchased at the Spider's Web in Lerwick on Shetland. Knitted in Shetland wool in autumnal shades of greens, golds and plums it is truly beautiful, warm and robust. 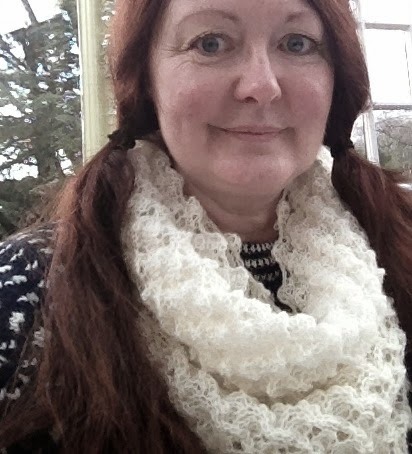 I'm wearing my 1950s aran cardigan which I must wear almost every day. It still has its leather shank buttons and never shows any sign of wear. A lot of the cardigans of this style that you find in vintage shops are replicas and/or made of acrylic yarns from the late 70s, early 1980s. There would appear to be no difference in price if you manage to find a wool one, so I would suggest do so if you can. It will probably still be around well after us. 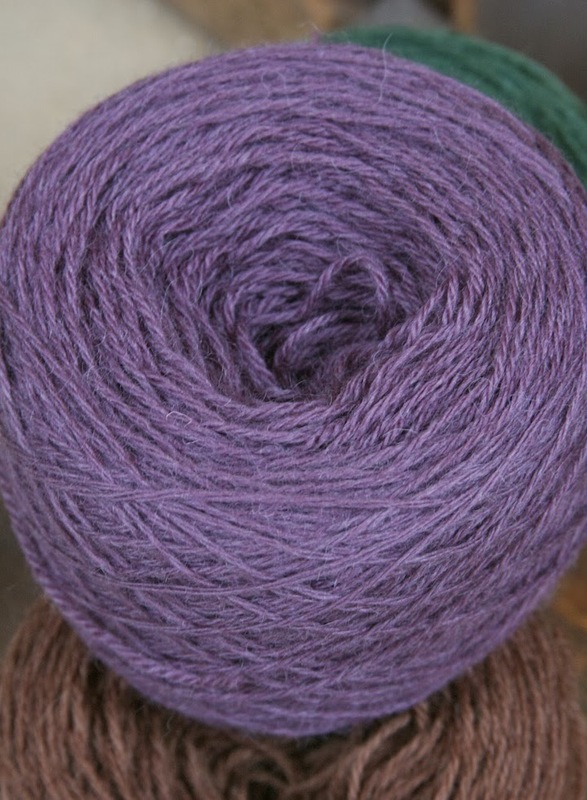 You can also condition wool to make it softer again, not something you can do with acrylic yarns. If you can't get one with leather buttons these are pretty easy to come by usually in mixed bags of random buttons in baskets in vintage shops. Buy them too and use them to replace the buttons on your aran cardigan. And there you have it. My holiday in knit wear!